This month I was excited to receive another beauty box from We Are Onyx. The monthly Onyx Box subscription service caters to women of color and is always a treat. The theme for February is, of course, love but more like pampering yourself. Items like these are a nice reminder that it’s okay to stop and make time to take care of your hair and body. A beauty box service is a fun way to find out about new products. This month, I am delighted to find shampoo and conditioner from a brand called Acure. Both are made with all natural ingredients including Moroccan Argan oil. I recently switched back to using ammonia free hair dye so it’s nice to find a shampoo and conditioner that are color safe. I’ve always wondered how my curls would react to using flax seed gel for styling. Now I can finally put it to the test with Carmella Marie’s My Gel. The product also contains jojoba oil which I understand is good for the hair and scalp. I can’t wait to try it! Speaking of scalp health, there is also a So Posh Beauty Herbal Hair Tea in this month’s Onyx Box. It has a blend of natural herbs for a tea that conditions the hair and treats the scalp. With peppermint and rosemary in the ingredients list you know it smells delish. Another product that smells good enough to eat is the Coquito Bubble Stuff shower gel by Honeycat Cosmetics. This is what pampering is all about! With ingredients like coconut, honey and rum you can’t go wrong. To round out the offerings in this month’s box of goodies we have hair products from Creme of Nature. There are two samples from the new Straight from Eden line as well as a full size container of the New Butter-Licious Curls Styling product. All three products are made with natural ingredients and are mineral oil, petrolatum and paraben free. NOTE: This month’s box was sent to me courtesy of We Are Onyx. I am not affiliated with any of the products and/or brands mentioned in this post. Please visit weareonyx.com for more information. Recently I was sent the Onyxbox for the month of January. What’s this you ask? It’s a monthly beauty subscription service that is geared towards women of color. Previously, the box has featured items from Shea Moisture, Cargo and OPI nails and a host of other beauty brands. So naturally I was excited to see what was in this month’s box and I was definitely not disappointed. There are so many natural hair brands out there who offer hair products for our textured tresses. A service like the Onyxbox allows you to try before you buy. Inside this month’s box were items from Woman to Woman Naturals, Anu Essentials and Beija Flor. This is my first time trying products from these brands and I am interested to see how they work on my hair. I already tested out the Creme Brulee Moisturizer from Beija Flor on my hair which is currently straight. It did not cause my hair to revert but left me with soft hair that smelled like cinnamon. The Anu Essentials line is one I’ve heard of on Instagram. There appears to be a small sample packet of nearly every product they offer in this month’s box. Then there is the leave-in conditioner by Woman to Woman Naturals. It has a citrus scent which will make for a nice mid-winter pick me up. But wait, there’s more! The wintery dry climate of Colorado has left me with dry skin. I was glad to find the Cracked Heel Stick Soap by Luxuriant in this month’s offerings. It says that it cleans and exfoliates so there may be hope for me yet! Lastly is the Golden Ticket Nail Sugar by Cinapro. To date, I have never seen a nail polish product with a light up cap. Where have I been? One of the best features about the Onyxbox service is that you can head over to www.weareonyx.com and shop the collection of goodies offered. There you can also sign up to receive your own monthly beauty box. See website for details. Note: This box was sent to me courtesy of WeAreOnyx for the purpose of this review. 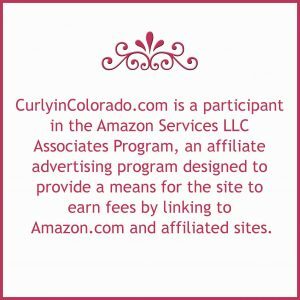 I am not affiliated with www.weareonyx.com and/or any of the brands mentioned above. This morning I posted a video on my Youtube channel showing my first impression after using the Purification Masque by Shea Moisture. The product claims to relieve itching from dry scalp caused by conditions like dandruff, eczema and psoriasis. I suffer from scalp psoriasis which thankfully is a lot better after taking my vitamin supplements and eating healthy. I still have a little bit of an itchy scalp so I thought I would try this product to see if it would help. Check out the video to see what I thought! 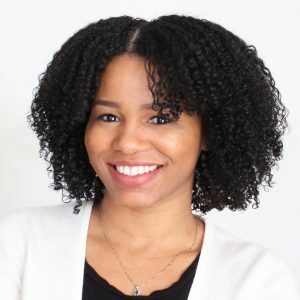 Earlier this year I celebrated 5 years on my natural hair journey and realized that I’ve pretty much stuck with the same products. I am usually one of those gals who like to use affordable products that can be found locally in stores. Once I figured out what worked for me, I stopped looking. Still, I couldn’t ignore all of the rave reviews that circulate in the natural hair world. For this reason, I decided maybe I could tweak my routine here and there. Who knows? Maybe I’m missing out. I was eyeing the Camille Rose products at my local Target store for some time and decided to try something from the line. I needed a moisturizer for when I do my wash n’ go so I grabbed the Curl Love Moisture Milk. You get 8 ounces for about $15 dollars USD which seemed reasonable considering it contains all natural ingredients. The product claims to,”nurture your tresses and aid in preventing breakage, shedding and styling damage.” The label also states that it, “…will provide shine, protective anti-oxidants and long-lasting moisture to enhance the driest hair.” This sounded like something that would certainly provide my hair with the moisture it needed under a heavy styler like Eco Styler gel. 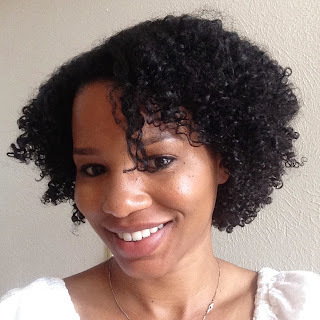 I love how gel makes my curls pop but I’m sometimes left with dry hair a few days later. I first tried it on wet hair after cleansing and conditioning. Then I decided to use a little grapeseed oil to seal in the moisture. Lastly, I sprayed each section of my hair with water before applying Eco gel. I was very surprised to see how much my curls clumped together. My hair also appeared to hang more than my usual wash n’ go. I let it airdry and realized that maybe adding the grapeseed oil was making my hair a bit too heavy. The next trial I decided to skip the oil and use the Curl Love as my sealer because it contains Castor oil. In this case I used Aussie Moist as my leave-in conditioner and then followed the same steps as before. The result was okay but my curls weren’t as juicy. The combo that worked best was when I used a leave-in conditioner, grapeseed oil to seal then the Curl Love all before applying the gel. This basically meant I was using the L.O.C. method (leave-in, oil, cream). Moisturizes and gives my curls hang time! I agree with the price point considering I am still on the same bottle a couple of months later. I realized early on that you don’t really need to use very much of the product in order to moisturize your hair. I even use it on my kid’s hair and feel like we’ve gotten a lot of use out of it. I would definitely purchase this product again in the future. 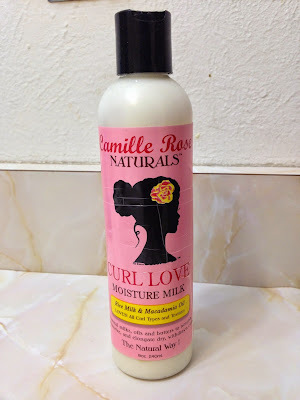 HAVE YOU TRIED THE CAMILLE ROSE NATURALS LINE? 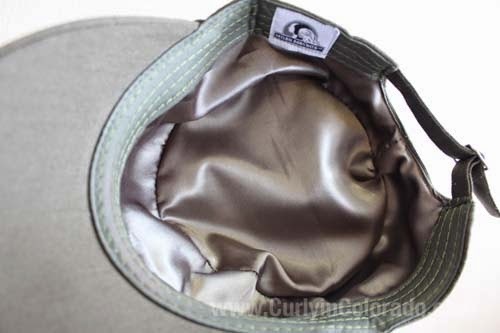 offered satin lined hats at affordable prices, I jumped at the chance to do a review. Why is a satin lining so important you ask? 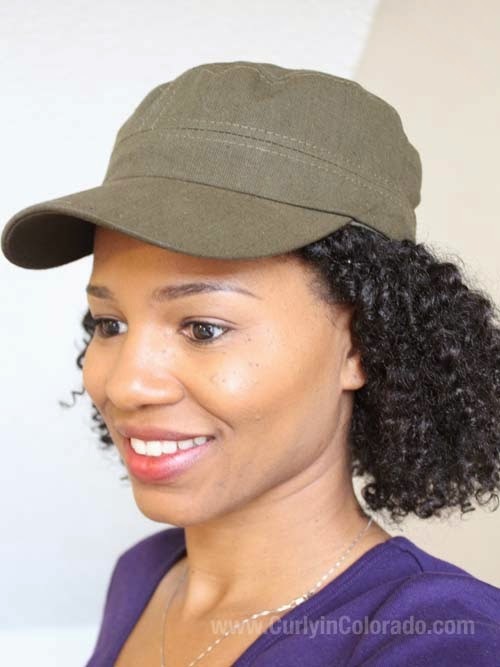 Well, for starters, it can help minimize frizz and matting that can occur when wearing a hat without the added lining. The smooth satin is what comes in contact with your hair which means less friction which in turn minimizes breakage. That’s music to my ears because I’m always concerned about how my hair will fare when wearing a typical hat. With this I have no worries. If you head over to the website, you’ll find the story detailing the relationship between the two friends who started the company. They were both on a hair journey and using satin bonnets and scarves, as we all do, to protect their hair at night. They, like me, wanted another option that was stylish for wearing out but still had the protective satin inside. What I like about their hats is the sound construction and the variety of styles that are available. I was sent a Military inspired cap but they also carry sun hats, fedoras and lots of fun knit beanies. 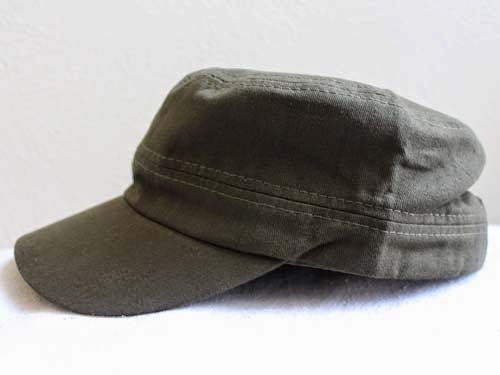 The Military caps are produced using a cotton blend. This is a plus because I’m planning to wear mine when I go on my walks this summer. The other hats are constructed using materials such as straw plaiting, flax and polyester. Each comes with a polyester satin lining. The knit beanies are polyester throughout which makes them machine washable but no dryer. I like that because I’m planning on getting one for my very active 12 year old son. I know my new hat will get a lot of use this summer. I’m favoring braid outs lately which means my braids are sometimes not completely dry in the morning. 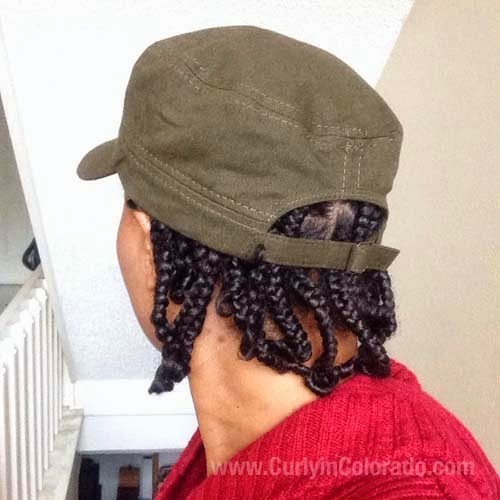 Now I can just throw on my satin lined cap and head out the door knowing my braids are still protected. I’ve tried this before with other hats but was having trouble getting all of the braids to fit. It even has room enough when my natural hair is in full swang. A hat that fits over my braids YAY! NOTE: The code will be active for the next 2 weeks and must be entered using all caps.